This is a simple mind mapping site that helps you organise your thoughts, whether you are constructing your site, sorting out the type of service you offer or planning out your strategy. In fact it can be used for anything at all – a shopping list if you wanted. Having a clear vision of what goes where and how things are sequenced is truly invaluable. There are more sophisticated examples out there, such as FreeMind, but this is easy one for starters. 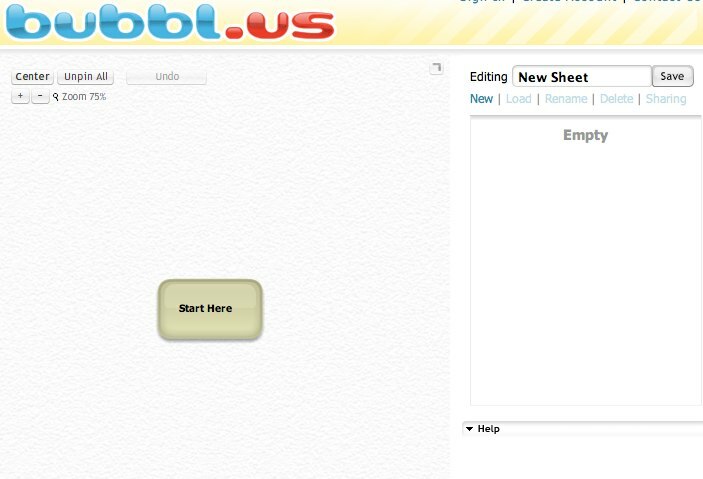 Click on ‘Start Brainstorming’ and a blank page appears with your start up bubble waiting in the middle. As you drag your cursor over the bubble, instructions on what each part allows you to do appear in the bottom right of the screen. You can click in the middle and write your title or note for that bubble, change its colour, click on the bottom middle of the bubble to create a new ‘child’ bubble, change the links between bubbles, create new siblings and constantly be dragging them round as you play around with your thoughts and finalise how you wish to sequence and organise them. Top right has the save button and it’s at this point you need to fill in Username, password email and Name. You give you page a name and whenever you log in again there will be a list of any previously saved mindmaps on the right hand side of the page for you to open and rework. It’s incredibly easy and fun.